Kuoni Group, a leading global travel and destination management services company, is in the midst of implementing a strategic directional shift, moving away from the tour-operating business. 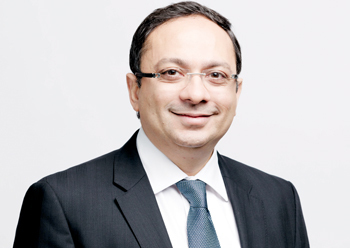 'We completed the sale of our tour operating business last year, as part of a decision to focus on models in the global B2B segment, in growth markets which we can continue to be in leading positions,' says Zubin Karkaria, CEO, Kuoni Group and CEO, VFS Global in an interview with TTN. Can you share the reasons why the company has moved from the tour operating business and can you throw more light on what Kuoni is focusing on now? Going forward, as part of the accelerated implementation of the Kuoni Group’s strategy, we will be focused on offering new products and services across our three divisions – Group Travel Services (GTS), Group Travel Distribution (GTD), and VFS Global – to make them more dynamic to compete in a digital environment. The idea has been to decentralise and increase autonomy of the three divisions to make them leaner, stronger and more competitive. GTD had organic growth of 10.6 per cent and VFS Global of 26.2 per cent in the first nine months 2015 – clearly above market, and we are confident their position as market leaders and potential for profitability will only strengthen in the months ahead. The GTS encountered a setback due to recessionary factors in source markets like Japan and Russia, but I am confident the restructuring, which includes a stronger customer focus, will enable this division to be properly positioned once again by 2017. What do you aim to bring to Kuoni in your time here? As mentioned Kuoni is in the midst of a transformation process, and it has been decided to accelerate the implementation of the new Kuoni Group strategy. My priority will be to ensure the transformation process is completed successfully as per our accelerated timelines. The core values of the group are strong and have held it in good stead for over a century. I will be working on enhancing them, focusing on entrepreneurship, a positive 'can-do' attitude, performance orientation, customer centricity and dynamism to build on our leadership positions on a sustainable basis. What do you aim to bring to/change in the travel industry today? The travel industry today is dynamic, shifting, and digital. So it has become imperative to innovate constantly, be disruptive leveraging technology, and forge symbiotic partnerships with like-minded organizations, if you want to stay ahead of this change. We have been able to do that with VFS Global, which pioneered the concept of visa process outsourcing, and I will focus on implementing this strategy across our other divisions too. Although the differences must be too many to count, can you explain how the business of travel is now different from when it used to be in your SOTC days? In a fairly short period of time, the travel business has undergone a transformation on many levels. The digital revolution has moved almost all operations and services into the online space. Where earlier the traveller visited a shop or agency, today, services come to his doorstep. Similarly, when a traveller wants to know more about a destination or accommodation or rates, he can access easily online. But travel agents as well use online technology to get easy access to services for their customers. And here Kuoni helps them as well to find best offers in an easy way, to save time and to sell more to their customers. Services on online and mobile platforms, such as apps, have leveraged on these changes in consumer behaviour and are today’s success stories in travel. So what we’re seeing is an entirely new ecosystem where tech-enabled models are taking the place of traditional models and revolutionising the travel business. Also, if you can tell us how similar the business remains (How some things have never changed and will never change in the business of travel – if there is any such thing, that is). Two of the most important qualities which remain unchanged – and are likely to remain so in the foreseeable future – are, one, the customer is the king, and two, the very dynamic nature of the travel industry. Growth potential also remains unchanged. Increasing affordability of tourism, opening up of economies, and availability of a wide range of choice for the consumer, have led to consistent growth in this sector. Hence, the nature of services being offered have remained the same, it’s just the platforms on which they are being offered that are changing. What do you see as the future of the travel agent and tour operator business in the Mideast region, say in the next five or ten years? With the pace of change in consumer demand, technology is going to play a key role in addressing customer requirements in all service delivery sectors today, be it travel or financial services or governance. This is true in the Middle East especially, which continues to be a big destination for both business and leisure, with hospitality and tourism playing an important role in the economy of the region. So travel businesses will have to adapt to this changing environment to remain competitive. Companies will have to find ways to remain relevant and add value in the overall value-chain. In addition, as technology brings so many different offerings it will become more important for companies serving their end consumers to keep the larger picture in mind. That’s where a company like Kuoni can support the travel industry with easy access and fast transactions to satisfy travel agents and other travel companies to sell more and make their customers happy.